Constitution‘s 217th year marked her 8th visit to Dry Dock 1 in the Charlestown Navy Yard. “Old Ironsides” entered the dock on May 18th to start her two-year restoration. Ongoing work on Constitution in 2015 included: cleaning the ship’s hull prior to docking, the dry docking, removing the mizzen mast fighting top for refurbishment, removing the copper sheathing, shaping and installing new hull planks and gun deck waterways, restoring the cutwater, and removing and repairing rigging. We’ll be posting updates right here throughout 2016, so check back often. Or better yet, subscribe to the restoration blog and each post will be mailed straight to your inbox! 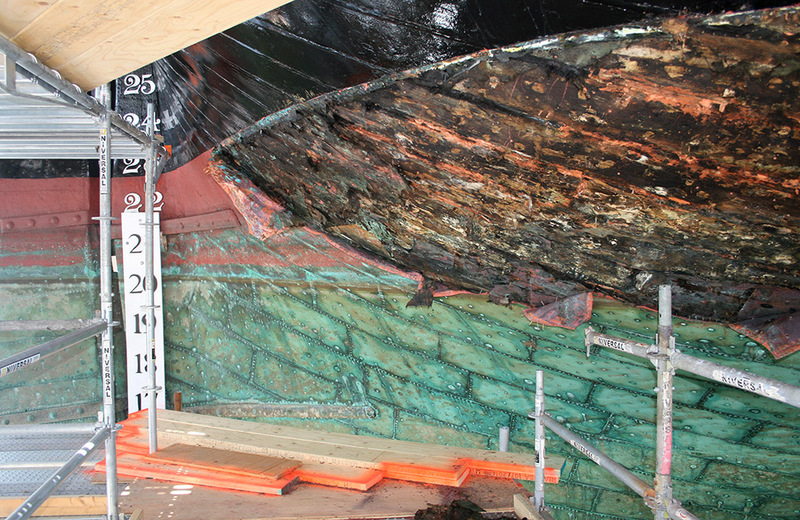 You can also see real-time photos of Constitution in dry dock via Constitution Cam. To celebrate an exciting year in Constitution‘s history and the start of the restoration, here are a few photos that capture special moments in 2015.